Unfortunately, many guitar students, especially adults, find themselves developing pain in various parts of the body due to practicing guitar. The good news is that this situation is completely avoidable, and also easy to reverse. In order to do so, we must understand where this "repetitive strain injury" as it is called, is coming from. It is not coming from the fact that you are repeating something over and over. It is coming from the fact that you are repeating actions that are fundamentally unbalanced, and this imbalance places strain upon delicate muscles in the hand, upper body and lower back. When we practice and play in this state of imbalance, pain is inevitable. Pain in playing guitar begins with how you hold the guitar when you practice. 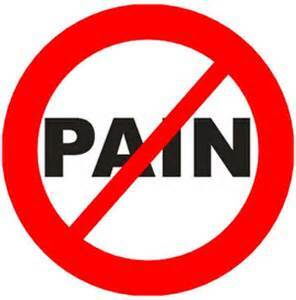 This is something I have to fix with virtually every student who comes to me complaining of pain. If we are not sitting and holding the guitar correctly when we practice, it will be impossible to position and use the hands correctly, or to develop the muscles that operate the fingers. It will also be impossible to be truly relaxed and flowing in our playing. When we play, we can sit, stand, or hold the guitar any way we want, or I should say any way that works, that enables us to get our notes. But when we practice, we must be in a balanced and ergonomic relationship to the guitar. This is because practicing is different than playing, practicing is where we train our muscles to be able to do new things, so they will be able to them when we play. To learn about the best sitting position for practice, regardless of what style you play or what kind of guitar you have, see "How To Sit With the Guitar For Practice". When our sitting position is unbalanced, and various muscles of the upper body are under strain simply trying to hold the guitar steady, it becomes impossible to position the hands and fingers in a way that allows for their careful and gradual development. This begins a series of problems in both right and left hands. This video will explain the many problems that we will have if our hands and fingers are not properly developed for the left hand. See "The 4 Diseases of the Left Hand on Guitar". If our sitting postion is corrected, and we develop our left hand correctly for operating on the guitar, your pains will diminish, and disappear. 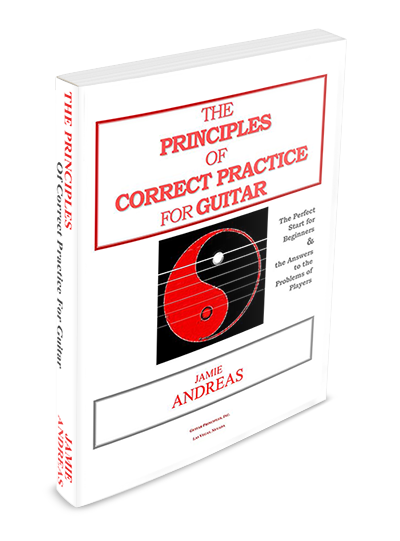 """Being able to operate a guitar probably would not have been possible without the Principles. The challenge of holding the guitar and making notes was difficult, painful, and therefore seemed like an insurmountable challenge." "Hi Jamie. I recently ordered your ‘principles- DVD’. It is truly amazing! I have played both the classical and the electric guitar a coulpe of years. My muscles developed tensions, resulting in growing pain. Then someone told me that correct playing should be done through relaxation, but there was one problem. I couldn’t find anyone telling me HOW that should be accomplished! Thank you for that!" "Most people might think that after playing guitar for 20 years, I’d be able to spot “trouble” areas... easily. Not so! After reading Chapter One, I discovered that I was experiencing a significant amount of pain when playing certain passages. After taking a close look at my playing, I discovered something that I learned 18 years ago was causing me all kinds of grief “today”. “ I had no consistency in my performance. And at higher tempos, I was experiencing pain during practice. Your book (“The Principles”) has made me understand “why”. Until I tried your principles, I never knew how much tension I had."